Below are common attributes associated to Hydrangea 'Little Lime'. Become a care taker for Hydrangea 'Little Lime'! Below are member comments regarding how to plant Hydrangea 'Little Lime'. No comments have been posted regarding how to plant Hydrangea 'Little Lime'. Be the first! Do you know how to plant Hydrangea 'Little Lime'? Below are member comments regarding how to prune Hydrangea 'Little Lime'. No comments have been posted regarding how to prune Hydrangea 'Little Lime'. Be the first! Do you know how to prune Hydrangea 'Little Lime'? Below are member comments regarding how to fertilize Hydrangea 'Little Lime'. 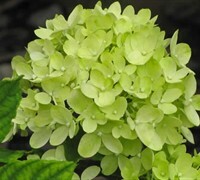 No comments have been posted regarding how to fertilize Hydrangea 'Little Lime'. Be the first! Do you know how to fertlize and water Hydrangea 'Little Lime'? Below are member comments regarding how to deal with Hydrangea 'Little Lime''s pests and problems. No comments have been posted regarding how to deal with Hydrangea 'Little Lime''s pests and problems. Be the first! Do you know how to deal with pests and problems with Hydrangea 'Little Lime'? Looking for Hydrangea 'Little Lime'? Get Little Lime Hydrangea fresh and large directly from the grower to your garden! Buy Little Lime Hydrangea online from the nursery wholesalers and save BIG! Plant Little Lime Hydrangea in well-drained moist soils. In northern climates the plant will tolerate full sun however, in the South it appreciates some afternoon shade or filtered sun. I feed Hydrangea with a well-balanced shrub and tree fertilizer right after new growth begins to emerge in spring. Alternatively you can use an organic plant food. Little Lime Hydrangea blooms on new wood (new stems). Any pruning is merely done to limit size or for aesthetic shaping by removing stray, broken, dead or crossing branches. Pruning is best done in early fall after the plant has finished blooming or in late winter before new growth begins to emerge. Avoid pruning these hydrangeas when they are preparing to bloom as this will effect flowering. Constantly soggy soil or full sun in southern climates can cause problems with the roots and foliage.